Fracture dislocations of the knee joint are complex injuries usually sustained following high velocity trauma. It is important to identify ligamentous injuries in patients with fractures around the knee joint, as persistent instability can lead to a poor outcome. Certain fracture patterns are more commonly associated with knee ligamentous injuries and can serve as signposts to them. Management of these injuries requires a combination of the principles of fracture management along with ligament repair and reconstruction. 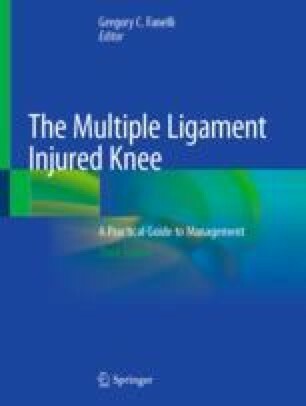 This chapter will cover the common fractures associated with knee ligament injuries and discuss management strategies.